The day of the showcase has finally arrived! The doors were opened for the public to come and see our work. To my own surprise there were a large number of attendees, including many curious pedestrians who wandered in. A few hours into the event, we had our panel review and were honored by the presence of several folks from the U.S. Embassy. Many attendees expressed profound interest in the projects and complimented the teams. I set the showcase up as a show-and-tell, booth-style event that allowed the participants to interact more directly with the audience then get feedback. People loved the idea of the Mobile Makerspace! From my perspective, Guatemala is looking at this idea as a great resource with economic impact. Guatemalans love ideas that promote small business. 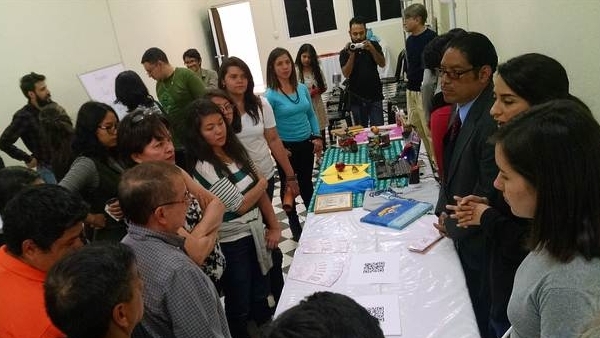 The attendees were so happy to see projects in Guatemala that promote economic prosperity! The panel was followed by a huge standing ovation. I usually do not mix business and emotions but that day I almost cried in public. I was so moved by the teams, the sacrifices they made to participate, and their dedication and time to the project. Thanks to all of them, I have a new understanding of hope. Thanks Guatemala, it was awesome!